The pair resumed descend in early hours of US session after holding within narrow consolidation during European trading. Fresh weakness comes as extension of previous day’s strong fall, sparked by optimistic tone about NAFTA agreement talks. 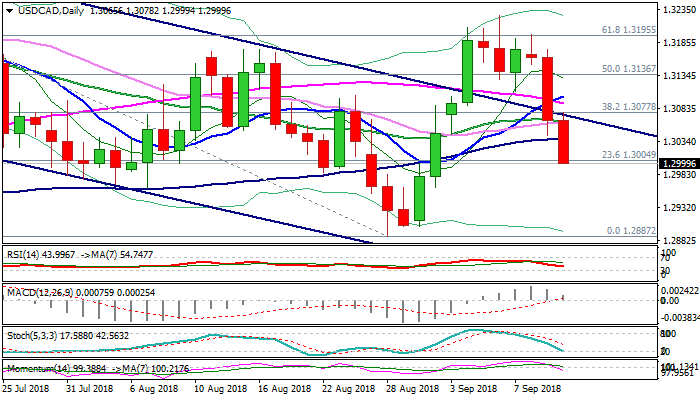 The loonie’s bullish sentiment was additionally boosted by weaker than expected US PPI data which hit the greenback, while Canada’s capacity utilization came at 85.5% in Q2, missing forecast at 86.9% but was well above Q1 downward-revised 83.7% figure. Fresh bearish acceleration cracked pivotal 1.3016 support (Fibo 61.8% of 1.2887/1.3226 ascend) and pressures psychological 1.30 support. Daily close below these points would be strong bearish signal for extension of steep fall 1.3174 (Tuesday’s high), towards next strong support at 1.2927 (top of thick weekly Ichimoku cloud. Rising bearish momentum supports scenario. Broken 100SMA offers initial resistance at 1.3038, while converged 20/30 SMA’s mark upper pivot at 1.3061.